Easy to send quiet message across a crowded room. Easy to use and the update made it even easier. Picked it up when it went free a while back. Just purchased all fonts for $1.99 Completely worth it. .....Was on a cruise recently and used this app to get my FIL's attention across a crowded room when there was no internet or cellphone service available. He thought it was a clever app. The initial price of 1.99 includes two fonts. 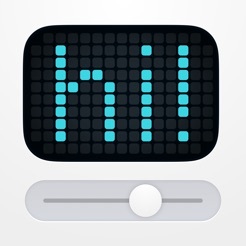 Make a button to pause the text as to say "...."
I like it. It's pretty cool. Although I wish there was an option, and I do like the speed change availability, where you can "pause" or "stop" the text and play as you will. And also, availability to change the font size. This is the app I've been looking for! Allows saving messages for easy use. Like slower traffic use right lane. Easy to use. Can send scrolling messages. Fun and easy to use at a reasonable price.